As the name suggests their objective is to reduce sway, or body roll, and stabilise a vehicle under lateral (cornering) forces. Formula 1 cars still use sway bars along side the shocks and springs as it is the ONLY suspension component principally designed to control body roll. Unfortunately, many aftermarket spring manufacturers still design their lowered springs too hard, trying to control body roll when it’s the sway bars job. The fitting of bigger Whiteline Swaybars is still the best dollar for dollar handling improvement you can make. Why? First, while car manufacturers appreciate the role the sway bar plays in vehicle control, safety and comfort, their standard bars, like the vehicles they are fitted to, are built to a compromise of price, performance and comfort. Secondly, handling and suspension design is an evolutionary process with constant changes. Whiteline Swaybars are at the cutting edge of this process through their close association with motorsport. We understand the new technologies and design products to put your car at the very front of handling development. Cornering loads are spread more evenly across the tyres delivering more grip and frankly, that’s what it’s all about. You also get improved tyre wear as your tyres stay flatter and more upright. Comfort improves because your car sits flatter through bends meaning less movement inside the vehicle. *BARS on CARS - What applies to me and my vehicle? * * Front Wheel Drive – increase the rear sway bar size * Rear Wheel Drive – increase the front sway bar size * 4 Wheel Drive – increase front then rear bar size * All Wheel Drive – increase rear then front bar size Whiteline Swaybars are manufactured using the finest grade Australian spring steel. They are powder coated and supplied with high performance Synthetic Elastomer mounting bushes in a DIY kit form, ready to simply bolt on. 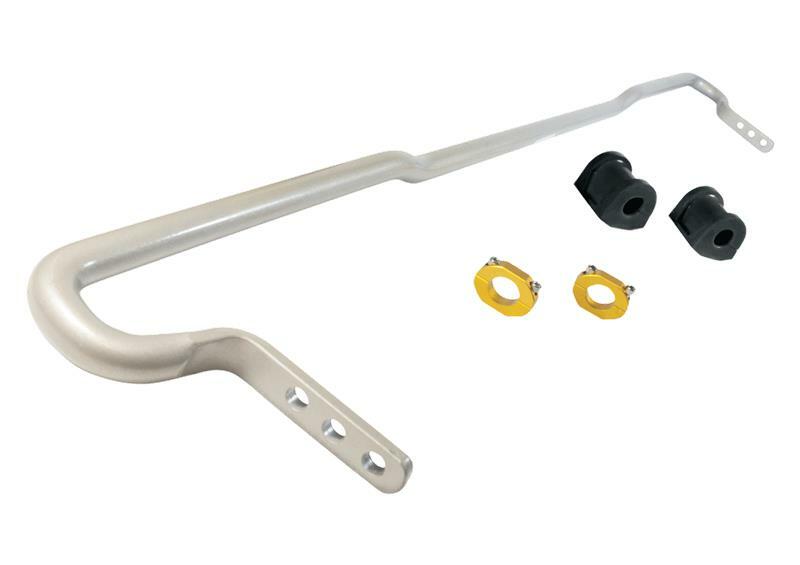 *Whiteline Adjustable Sway Bars* Adjustable sway bars allow their stiffness to be altered by increasing or reducing the length of the lever arms. This permits the roll stiffness to be tuned for different situations without replacing the entire bar. The stiffer the bar, the more force required to move the left and right wheels relative to each other. This increases the amount of force required to make the body roll. Whiteline adjustable sway bars offer from 2 up to 4 points of adjustment allowing in some cases 10 distinct stiffness settings for precise handling bias adjustment. The Whiteline Blade is available across a huge range of applications. 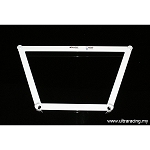 Whiteline Swaybars are part of the Whiteline handling system. Designed to match and integrate with Chassis Bracing and key alignment products to deliver a fully balanced handling solution. Adjustable sway bars allow their stiffness to be altered by increasing or reducing the length of the lever arms. So without reducing comfort, a Whiteline Swaybar will make your suspension system and tyres perform better, making the car more responsive while delivering more grip.